EU research has investigated protein profiles for individual pigs so the producer will be able to determine the cut of meat from the genetics of the pig. With genomic analysis, there has been considerable progress made in determining the variability of genomes in all main livestock species. However, linking the genome with its phenotype in terms of meat quality and type for the producer remains challenging. Advances in 'omics' technologies are providing the necessary tools to extensively phenotype increasingly large collections of individuals. The EU Marie Skłodowska-Curie Individual Fellowship-aided project MARKTHEPIG has applied the newly emerging area of phenomics to merge the significant amount of data from omics technologies. Phenomics is an emerging trans-discipline that systematically studies the genome-wide phenotypic manifestations at cellular and organism levels. As Prof. Luca Fontanesi, project coordinator of MARKTHEPIG, explains: "The aim of the current project was to take advantage of the knowledge obtained by the University of Bologna in highly phenotyped pigs to better understand the factors, both genetic and non-genetic, that contribute to the production variability of the animals." These factors have important consequences in designing selection and breeding strategies for this species. MARKTHEPIG used mass spectrometry-based proteomics to identify new biomarkers that might describe internal or molecular phenotypes to predict production performances of the animals at the genetic level. In addition, project results opened up new possibilities for use of phenomics to better characterise the pig as an animal model. At the heart of the metabolism of an animal is its liver. For the first time, MARKTHEPIG described the molecular differences between two important pig breeds in terms of liver and its protein profile. "A total of about 500 proteomic spots were captured and identified. Of these, 25 resulted in differential expression in the livers of pigs belonging to two main heavy breeds of pig used to prepare dry-cured ham," outlines Prof. Fontanesi. 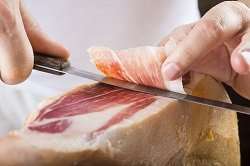 In terms of what makes ham or bacon, the team detected differences in the liver proteomic profile that might explain, indirectly, differences at the muscle tissue level. Results of the project's work have just been published in the peer-reviewed journal PLOS ONE. To fulfil the objectives of the project, MARKTHEPIG conducted advanced proteomics analyses that the local lab couldn't support. As a solution, alternative labs at the University of Bologna provided the necessary expertise in proteomics. After project close, the host lab intends to continue to further exploit molecular phenotypes in the pigs. The goal is to further describe the genetic variability within and between breeds. "The biological repository we have collected during these years will provide an important resource for future studies based on high-throughput molecular phenotyping technologies," notes Prof. Fontanesi. Prof. Fontanesi acknowledges that the Marie Curie Individual Fellowship has enabled the formation of a larger reference population of pigs by adding other molecular phenotypes to a population of pigs already genotyped and phenotyped with many additional biomarkers. "This resource will become a sort of reference population for many other studies with potential high impact in the pig breeding and selection sector and in the basic biology," he concludes.